In April 2005, the husband and wife team Liza et Ziad Asseily opened their first restaurant, creating a vibrant Lebanese bubble in the heart of Paris, Bourse district. In 2015, they asked the talented Maria Ousseimi – the interior designer of LIZA BEIRUT – to embellish the Paris location by supplementing Hubert Fattal’s existing décor. The result is a subtle refurbishment that clearly connects the identities of the two establishments. Every day except Sunday evenings. From 7:30 pm Thursdays, Fridays and Saturdays. every Saturdays and Sundays, from 12 to 3:30. The LIZA signature is high-end healthy comfort food. 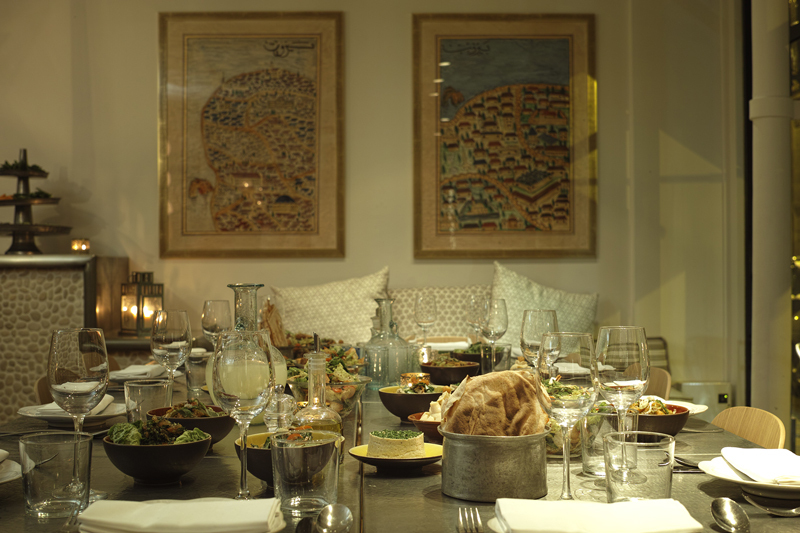 The first creative Lebanese cuisine of its sort in Paris, with a mezzé menu consisting of fattouche salad (gem lettuce, mint, radish, cherry tomatoes, cucumbers, croutons and sumac vinaigrette), kébbé heloué (sweet and savoury beef meatballs with a basil, pine nut, honey dipping sauce), fatayer djej (a chicken wrap with garlic cream and Lebanese pickles), hommos bi tahiné (chickpeas, sesame paste and lemon juice), kharouf mehché (roasted lamb with spiced Basmati rice, nuts and dried fruit). Based on the Lebanese requirement to have an abundance of food to share, the Mezzés menu offers a selection of 10 mezzés (hot and cold), mixed grills and an assortment of desserts. At lunch, LIZA also proposes a tasting selection of 5 mezzés, served on a copper tray custom made by Karen Chekerjian. NEW: Each month, the chef proposes a short menu of seasonal culinary creations. Brunch at LIZA has become a true Week end tradition; the ceremonious meeting point for the Lebanese community in Paris; a moment of conviviality and gourmandise. 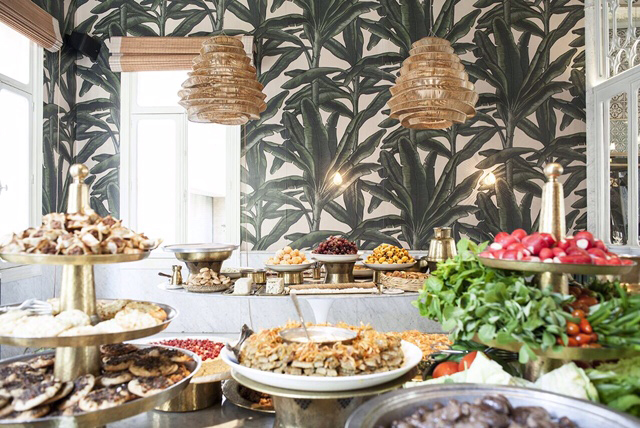 Each week, the feast is served buffet-style on a huge center table piled high with freshly baked goods, indispensable mezzés like hommos and eggplant babaghannouj, taboulé salad, and a selection of Lebanese cheeses, including kashkawal, halloum and labné. There is also, of course, the requisite moulokhié (grilled chicken and Basmati rice served with chard and coriander) – an essential component of a Lebanese brunch! – as well as lamb pastries, signature desserts (baklawas, fruit salad, orange blossom custard) and unlimited coffee, tea and fresh juice. from 10 to 140 people.